Atomic scale view of the perovskite crystal structure forming ('self-assembling'). The potassium ions (in red) are decorating the surfaces of the structures to heal defects and immobilising the excess halides. An international team of researchers led by the University of Cambridge found that the addition of potassium iodide 'healed' the defects and immobilised ion movement, which to date have limited the efficiency of cheap perovskite solar cells. These next-generation solar cells could be used as an efficiency-boosting layer on top of existing silicon-based solar cells, or be made into stand-alone solar cells or coloured LEDs. The solar cells in the study are based on metal halide perovskites - a promising group of ionic semiconductor materials that in just a few short years of development now rival commercial thin film photovoltaic technologies in terms of their efficiency in converting sunlight into electricity. Perovskites are cheap and easy to produce at low temperatures, which makes them attractive for next-generation solar cells and lighting. 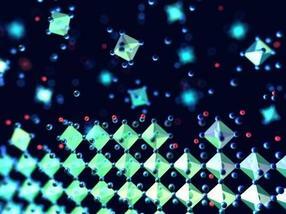 Despite the potential of perovskites, some limitations have hampered their efficiency and consistency. Tiny defects in the crystalline structure of perovskites, called traps, can cause electrons to get 'stuck' before their energy can be harnessed. The easier that electrons can move around in a solar cell material, the more efficient that material will be at converting photons, particles of light, into electricity. Another issue is that ions can move around in the solar cell when illuminated, which can cause a change in the bandgap - the colour of light the material absorbs. The researchers demonstrated promising performance with the perovskite bandgaps ideal for layering on top of a silicon solar cell or with another perovskite layer - so-called tandem solar cells. Silicon tandem solar cells are the most likely first widespread application of perovskites. By adding a perovskite layer, light can be more efficiently harvested from a wider range of the solar spectrum. "We've found that perovskites are very tolerant to additives - you can add new components and they'll perform better," said first author Mojtaba Abdi-Jalebi, a PhD candidate at the Cavendish Laboratory who is funded by Nava Technology Limited. "Unlike other photovoltaic technologies, we don't need to add an additional layer to improve performance, the additive is simply mixed in with the perovskite ink." The perovskite and potassium devices showed good stability in tests, and were 21.5% efficient at converting light into electricity, which is similar to the best perovskite-based solar cells and not far below the practical efficiency limit of silicon-based solar cells, which is (29%). Tandem cells made of two perovskite layers with ideal bandgaps have a theoretical efficiency limit of 45% and a practical limit of 35% - both of which are higher than the current practical efficiency limits for silicon. "You get more power for your money," said Stranks.